These personalized baby gifts are perfect items that any new parent would appreciate! 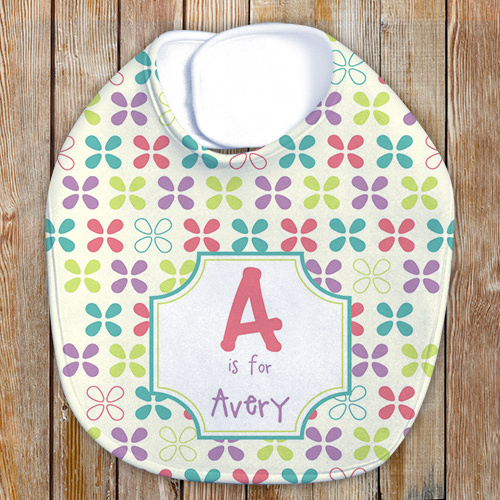 You can't have enough baby bibs, and this name and initial design ensures that the bib you give will be the cutest this baby girl has. Our Personalized Baby Girl Bib is available on our premium white cotton/poly trimmed bib with Velcro closure. Machine washable in one size fits most. Free personalization of any initial and name is included with all Customized Baby Gifts. Additional Details This is one personalized gift that will ensure your baby stays as clean as possible during meal times. Any new parent would appreciate a baby bib that is personalized specifically for their little girl. Our Personalized Name and Initial Baby Boy Bib would be perfect for a baby boy!